My approach to childbirth preparation is a blend of HypnoBirthing, yoga, mindfulness meditation, shamanism and the teachings of the Buddha. Each session is tailored to suit my clients’ individual needs. In my private sessions and workshops I teach women to use mindfulness, body awareness, and the breath as an anchor to the present moment. Here we learn to meet what we experience with open, expansive awareness, cultivating a conscious response of loving-kindness and the deepening of our breath. It is in resistance that we escalate strong, healthy sensations into pain and possibly suffering. If we don’t judge what we feel then we can embrace it, making it much more manageable. We can then even find the threads of joy and gratitude for all that is well in that moment. My studies of shamanism and Depth Hypnosis also inform the way I approach birth preparation, seeing this process as an initiation, a rite of passage that is sacred and primal. Private childbirth preparation sessions are perfect for second/third time parents, those who have specific issues or fears regarding birth, those with scheduling limitations who would otherwise opt out of classes and workshops, or those who would just prefer to do their birth prep in the comfort and privacy of their own homes. 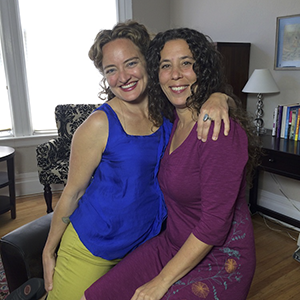 I often do private sessions with my doula clients, which means we get even more time together before the birth! In addition to my training as a birth doula, prenatal yoga teacher and prenatal bodyworker, I was certified as a HypnoBirthing Practitioner in 2005. I have found HypnoBirthing to be one of the best ways to prepare for a relaxed, gentler, healthier and more comfortable birth. Using the power of affirmations, visualization, and deep relaxation techniques, HypnoBirthing can help laboring mammas relax their bodies, rely on their breathing for managing intensity, and connect to their own inner wisdom and strength. Women who prepare for birth this way tend to have more confidence and less fear as they approach birth and parenting. Since I started applying this approach in my doula practice, I have seen shorter, easier labors and more natural births. Please contact me to create a childbirth preparation package that suits your needs. Prices begin at $110 per hour. Discounts are given to my doula clients. See below for info about group classes with my associate, Rachel Yellin. Britt eased me through my labor so peacefully that the 17 hours rolled gently by. She gave me thoughtful and unobtrusive support, letting me stay calm and focussed. I whole-heartedly believe her guiding breath work and opening postures allowed me to relax into a seamless quick childbirth experience I will never forget! For those seeking Childbirth Preparation classes in a group setting, I highly recommend Rachel Yellin’s Hypnosis Based curriculum. Rachel and I have been collaborating and inspiring each other since 2003 and are completely aligned in our philosophies and practices. Most of my doula clients over the past decade have taken her classes and have been impressed with her professionalism, candor, lively discussions and most importantly, essential skills and techniques proven to facilitate a smooth, conscious and positive birth.